Two seasons of excavation during 2003 and 2004 were undertaken on the early medieval cemetery at Towyn y Capel, resulting in the complete excavation of the site. The work was supervised by Andrew Davidson and George Smith from Gwynedd Archaeological Trust, and undertaken with the aid of archaeology students from University College, Cardiff and forensic science students from University of Central Lancashire, Preston. Advice and valuable assistance was given by Michael Wysocki, Jennie Hawcroft and Rosa Spencer from the Department of Forensic and Investigative Science, UCLan. A programme for the post-excavation phase of the project was prepared at the start 2005-6, and was largely completed within that year. The report on the skeletons from University of Central Lancashire was received from UCLan in 2008 and final textual changes were made reflecting the revised content of the UCLan report. Contact was made with the editor of Medieval Archaeology, who agreed to accept the article in principle, and Dr Nancy Edwards agreed to proof-read the article. Final editing of the illustrations to suit the Medieval Archaeology format has now been undertaken. The full depth of the sand was not established below the burials, though the presence of peat deposits on the beach some 4m lower may give some indication of the depth of the sand here. The cist graves had all been dug into this sand layer. This layer was found over the entire excavation area. The deposit consisted of a thick layer of dark humic sand up to 0.3m thick. It was interpreted as a buried soil, which would have developed during a relatively long period of stability when sand incursions were at a minimum. The layer sloped upwards from east to west rising by 1.5m, and upwards from south to north. There are indications also that the level was falling to the north from a high point towards the north end of the site. This would indicate the presence of a low mound, though no part of the western slope towards the sea has remained to confirm this. The soil contained significant quantities of charcoal, identified as a mixture of oak, hazel and birch. A sample from the hazel and birch was dated to 1450+/-40 radiocarbon years (Beta-204435), which calibrates to AD 540 – 660 (2 sigma). All the burials were stratigraphically later than the buried soil. The soil layer marks a prolonged stable period within the formation of the mound, which took place sometime within the latter part of the sixth century and the early part of the seventh century AD. Cattle, sheep and pig were being kept on or close to the site, and the charcoal suggests trees grew close-by. A series of burials were dug through the buried soil described above. However, where the evidence survived, it could be clearly seen that the burials were not dug from the buried soil horizon, but through a layer of sand some 20cm thick that lay above. It would appear, therefore, that sand incursions had buried the earlier land surface before the site was used as a burial ground. The bodies were laid in stone-lined cists buried some 0.5m to 1m below the surface. Where sufficient evidence survived, the graves were found to be covered by a low mound, surrounded by a ring of upright stones. Following the insertion of the cist burials, far greater sand incursions took place. Sand accumulated to a depth of approximately 2m in layers which were differentiated by changes in coarseness of the sand. The coarser layers of sand are assumed to have been laid down during periods of greater turbulence. The top of the accumulated sand was marked by a layer of dark humic sand interpreted as a buried turf line marking a period of dune stability. This turf line sloped from a western ridge down to the east, away from the sea front, and was interpreted as the landward side of a raised mound, now much more pronounced than the mound in which the cist burials were laid. The buried soil was mainly confined to the southern side. Within the 2m layer of wind-blown sand lay a series of dug burials. Remains of approximately 100 individuals were found, though many of these in the upper layers were disturbed and incomplete. The burials were spread over an area measuring approximately 30m by 10m. The majority of the burials were concentrated in the upper 1.4m layers of sand, and were much sparser in the lower 0.4 m. It was not possible to identify with certainty the horizons from which the graves had been dug but the burials had not been dug through the buried turf line, and there were no other clearly identifiable layers marking periods of stability. The few graves which it was possible to record in section were cut from different levels, but were all of a depth of approximately 0.5m Several burials lay very close to the upper turf line, and some were partially truncated. 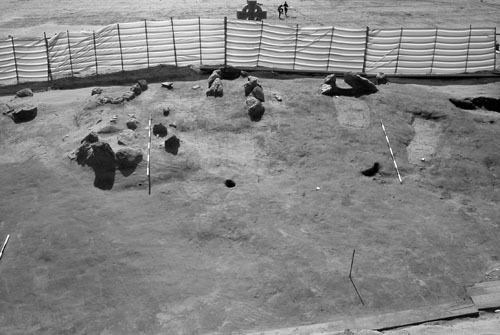 The evidence suggests that the mounds placed over the cist burials were not exposed for any substantial period of time before they were covered with wind-blown sand. This is evidenced by the lack of any vegetation growth on top of the mounds, and the surviving presence of the stones surrounding the mounds, including the row of quartz pebbles over grave 214. The tight grouping of the radiocarbon dates from four of the cist graves, and a contemporary date from one of the dug burials, is further evidence for a rapid influx of sand shortly after the cist burials. None of the dug burials lay below the lower buried soil. There was no evidence that any of the dug burials had been inserted through the upper buried soil. The layer from which the burials had been dug was not, therefore, immediately apparent. However the presence of partially truncated skeletons immediately under the upper surface would suggest that erosion had removed the upper surface from which burials were made. The depth of burials would also suggest that burials were made whilst the sand was accumulating. Overlying the buried turf line was a large distinct concentration of boulders and stones. These defined the seaward (eroded) edge of the buried turf line, and lay in line along the edge, though also lower down the slope. Though no distinct wall faces were found, the stones at the upper edge were largely horizontal, and formed a tight grouping, whereas those lower down the slope lay at an angle on top of the buried turf and were more widespread. There was no mortar associated with the narrower band of stone at the top. There were patches of lime mortar associated with the stones lying more randomly. The horizontal stones are interpreted as the remains of a stone wall encircling the former chapel. A wall in this location is shown on Stanley’s plan of 1846. The other stones are thought either to have slipped from this wall down the slope, or from the former chapel above. Stanley records that the lower walls of the chapel were not mortared, but that the upper stones were mortared. This would apply particularly to those stones leaning against and upon the narrower band of stone interpreted as a cemetery wall, and those associated with small patches of mortar. This phase, therefore, is thought to contain elements of the collapse of the stone built chapel. As this is unlikely to have taken place much before 1800 (Moses Griffiths sketch of c. 1780 shows the walls virtually intact) it might be suggested that the stone wall was constructed late on in the history of the chapel, perhaps during a relatively stable period following a period of erosion. If the interpretation of the buried soil as a relatively late development, following a period of erosion, is correct, then the surface contemporary with the construction of the chapel on top of the mound is eroded. The layer is interpreted as a buried turf line, marking a period of dune stability. It can be dated later than the stone wall which surrounded the chapel, and, given the lack of stone and mortar, is likely to be later than the destruction of the chapel by erosion. The lack of finds may be partly due to the steepness of the slope, which would have encouraged objects to roll down beyond the limits of the excavation, though evidence for more activity would have been expected had the dunes been in regular use.